Guide to finding books, journals, databases, patents, standards, dissertations, citation management. 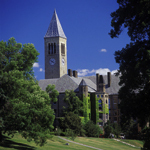 There are 20 libraries at Cornell, see library homepage at http://www.library.cornell.edu/about us. 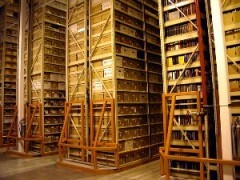 Includes 8 million print volumes, one million ebooks, 111,000 electronic journals. Below are a few of the libraries you may use while you are here. 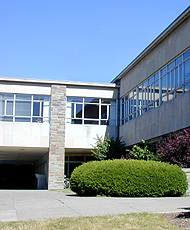 The oldest library building at Cornell, Uris Library houses a large collection of multiple copies of basic titles in the humanities and social sciences. 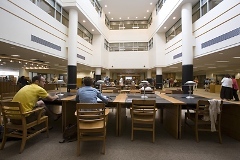 The Engineering Library collection includes applied and engineering physics, civil and environmental engineering, chemical engineering, computer science, electrical engineering and computer engineering, geological sciences, materials science and engineering, operations research and industrial engineering, and theoretical and applied mechanics. The Mathematics Library supports research and instruction in mathematics, statistics, and their wide range of applications. In addition to the outstanding research collection, holdings include introductory, expository, recreational, historical, and biographical materials. The Library Annex, our off-site storage facility for less-frequently used materials, is composed of 4 warehouses each large enough to hold a Boeing 757 and four stories tall inside. 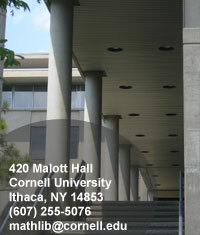 Request online for books to be delivered to the Ithaca campus as well as scanned online copies of articles. Newly rennovated 5 story atrium serves the Colleges of Agriculture & Life Sciences and Human Ecology.